Pictured (right) is John J Audubon’s illustration of the Swallow-tailed Hawk, today commonly referred to as the American Swallow-tailed Kite. 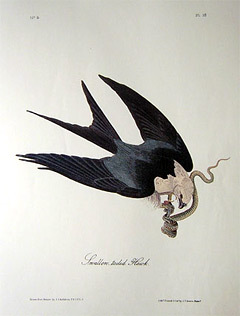 This hand-colored lithograph is Plate #18 from the Octavo Edition of Birds of America – created from 1840 to 1844. “The flight of this elegant species of Hawk is singularly beautiful and protracted. It moves through the air with such ease and grace, that it is impossible for any individual, who takes the least pleasure in observing the manners of birds, not to be delighted by the sight of it whilst on wing. Gliding along in easy flappings, it rises in wide circles to an immense height, inclining in various ways its deeply forked tail, to assist the direction of its course, dives with the rapidity of lightning, and, suddenly checking itself, reascends, soars away, and is soon out of sight. At other times a flock of these birds, amounting to fifteen or twenty individuals, is seen hovering around the trees. They dive in rapid succession amongst the branches, glancing along the trunks, and seizing in their course the insects and small lizards of which they are in quest. Their motions are astonishingly rapid, and the deep curves which they describe, their sudden doublings and crossings, and the extreme ease with which they seem to cleave the air, excite the admiration of him who views them while thus employed in searching for food. A solitary individual of this species has once or twice been seen in Pennsylvania. Farther to the eastward the Swallow-tailed Hawk has never, I believe, been observed. Travelling southward, along the Atlantic coast we find it in Virginia, although in very small numbers. Beyond that State it becomes more abundant. Near the Falls of the Ohio, a pair had a nest and reared four young, ones, in 1820. In the lower parts of Kentucky it begins to become more numerous; but in the States farther to the south, and particularly in parts near the sea, it is abundant. In the large prairies of the Attacapas and Oppellousas it is extremely common. In the States of Louisiana and Mississippi, where these birds are abundant, they arrive in large companies, in the beginning of April, and are heard uttering a sharp plaintive note. At this period I generally remarked that they came from the westward, and have counted upwards of a hundred in the space of an hour, passing over me in a direct easterly course. At that season, and in the beginning of September, when they all retire from the United States, they are easily approached when they have alighted, being then apparently fatigued, and busily engaged in preparing themselves for continuing their journey, by dressing and oiling their feathers. At all other times, however, it is extremely difficult to get near them, as they are generally on wing through the day, and at night rest on the highest pines and cypresses, bordering the river-bluffs, the lakes or the swamps of that district of country. They always feed on the wing. In calm and warm weather, they soar to an immense height, pursuing the large insects called Musquito Hawks, and performing the most singular evolutions that can be conceived, using their tail with an elegance of motion peculiar to themselves. Their principal food, however, is large grasshoppers, grass-caterpillars, small snakes, lizards, and frogs. They sweep close over the fields, sometimes seeming to alight for a moment to secure a snake, and holding it fast by the neck, carry it off, and devour it in the air. When searching for grasshoppers and caterpillars, it is not difficult to approach them under cover of a fence or tree. When one is then killed and falls to the ground, the whole flock comes over the dead bird, as if intent upon carrying it off. An excellent opportunity is thus afforded of shooting as many as may be wanted, and I have killed several of these Hawks in this manner, firing as fast as I could load my gun. The Fork-tailed Hawks are also very fond of frequenting the creeks, which, in that country, are much encumbered with drifted logs and accumulations of sand, in order to pick up some of the numerous water-snakes which lie basking in the sun. At other times, they dash along the trunks of trees, and snap off the pupae of the locust, or that insect itself. Although when on wing they move with a grace and ease which it is impossible to describe, yet on the ground they are scarcely able to walk. I kept for several days one which had been slightly wounded in the wing. It refused to eat, kept the feathers of the head and rump constantly erect, and vomited several times part of the contents of its stomach. It never threw itself on its back, nor attempted to strike with its talons, unless when taken up by the tip of the wing. It died from inanition, as it constantly refused the food placed before it in profusion, and instantly vomited what had been thrust down its throat. The Swallow-tailed Hawk pairs immediately after its arrival in the Southern States, and as its courtships take place on the wing, its motions are then more beautiful than ever. The nest is usually placed on the top branches of the tallest oak or pine tree, situated on the margin of a stream or pond. It resembles that of the Common Crow externally, being formed of dry sticks, intermixed with Spanish moss, and is lined with coarse grasses and a few feathers. The eggs are from four to six, of a greenish-white colour, with a few irregular blotches of dark brown at the larger end. The male and the female sit alternately, the one feeding the other. The young are at first covered with buff-coloured down. Their next covering exhibits the pure white and black of the old birds, but without any of the glossy purplish tints of the latter. The tail, which at first is but slightly forked, becomes more so in a few weeks, and at the approach of autumn exhibits little difference from that of the adult birds. The plumage is completed the first spring. Only one brood is raised in the season. The species leaves the United States in the beginning of September, moving off in flocks, which are formed immediately after the breeding season is over. Hardly any difference as to external appearance exists between the sexes. They never attack birds or quadrupeds of any species, with the view of preying upon them. I never saw one alight on the ground. They secure their prey as they pass closely over it, and in so doing sometimes seem to alight, particularly when securing a snake. The common name of the Snake represented in the plate is the Garter Snake. SWALLOW-TAILED HAWK, Falco furcatus, Wils. Amer. Orn., vol. vi. p. 70. FALCO FURCATUS, Bonap. Syn., p. 31. SWALLOW-TAILED HAWK, Falco furcatus, Aud. Orn. Biog., vol. i. p. 368; vol. v. p. 371. Wings very long and acute, the third quill longest, the first equal to the fifth, the primaries widely graduated, the secondaries comparatively very short. Tail very deeply forked, of twelve feathers, the lateral ones extremely elongated. Bill bluish-black above, light blue on the cere, and the edges of both mandibles. Edges of the eyelids light blue; iris black. Feet light blue, tinged with green; claws flesh-coloured. The head, the neck all round, and the under parts, are white, tined with bluish-grey; the shafts of the head, neck, and breast blackish. The rest of the plumage is black, with blue and purple reflections. Length 25 inches; extent of wings 51 1/2; beak along the back 1 1/4.